Geared for both iPhone and iPad–users with brand new iPhone 5 models will be especially happy to see this one–PayAnywhere allows for a way to collect payments. It’s a free app, which also reportedly comes with a free credit card reader, sent by mail later following the download of the app. 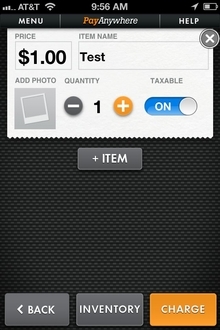 PayAnywhere allows users to scan cards with said reader and collect the fees. It allows users to generate receipts for those who make payments, working with AirPrint and Star thermal printers, and allows for discounts. Transactions are encrypted to PCI standards for top-notch security, and allows for the addition of discounts or customer tips. It has inventory tools, built-in reporting to allow users to spot sales trends and react accordingly. Best of all, it does all of this for just 2.69 percent of every swiped transaction, without monthly minimums or anything resembling a recurring fee. For those whose small businesses involve a lot of dealing with cash, especially those who deal with the public directly, the issue of credit card payments has always been something of a difficult one. You want the kind of market that’s ready to spend with a credit card, of course, but actually working with the cards can be difficult. With PayAnywhere, meanwhile, it becomes quite a bit easier to work with cards. No one wants to turn people away, especially those willing to actually spend money–this is especially true in the kind of economy we’re facing down right now. But at the same time, more traditional methods involved heftier fees, and more of them. 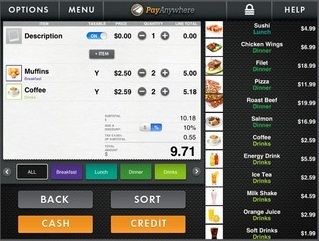 PayAnywhere makes it simpler, and even less expensive, to take those payments. It’s a lot easier to work with as well, and much more portable, making it possible to turn sales reps into payment processors. Naturally, improving the time to turn accounts receivable into cash is a huge help for any small business, but getting customers to come to you is just as important. Cloud-based telephony features like screen pops and hunt groups will not only make making contact with your sales teams easier for customers, it will also likely improve the interaction, providing a better chance to get the sale. But PayAnywhere, however, will provide not only a way to better get the sale, but a way to more rapidly convert the sale to cash. That means important things for small businesses, and while it may not be for everybody, it’s going to go a long way toward putting extra life in sales, and in the business itself. This entry was posted in iOS Apps, iPad Apps, Sales, Small Business, Virtual Office by Steve. Bookmark the permalink.